The finalists are here! Last week we put the call out asking you to write about what you love about running trails and/or ultramarathons. We had so many fantastic posts, we may have been relegated to leg wrestling and straw pulling to determine the finalists…Okay, not really, but we did have a tough time whittling it down to just three! Read them now and cast your vote in the comments below for the entry that is most deserving of the coveted Ultimate Direction Scott Jurek Ultra Vest! It’s a mother, daughter thing! When I think about my trail running experiences, I forget about the cute New Balance shoes, the unmentionable places I have scars from rubbing Gu packages, and the gallon of blood lost to rocks, roots, and lovely blisters. Instead I think of my training partner: the person who introduced me to running and the one I can count on to push me when needed. She is the person who is on the trail along side of me on every run: my mother, Brenda Campbell. My mom is forty-six years old, has been a runner all my life, has run over 15 marathons and has just completed her first ultra-marathon. Without her, my love of running and introduction into ultra-running would never have happened. I evolved into the runner I am because of her encouragement, through each new “longest” distance, and running me into the finish of my first marathon. She is there every morning sharing the pre-run peanut butter and is there next to me on the couch during our 10thviewing of Unbreakable. 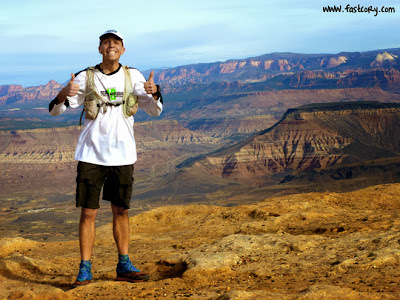 My love of ultra-running surfaced through blogs, books, and fellow ultra-runners. 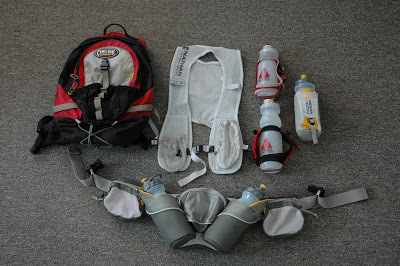 When my mom decided to look into running her first ultra, we dove, or rather plunged into the world of Ultimate Direction vests, hydration packs, and Trail Runner Nation podcasts. We watched Anton Krupicka run through the High Country and followed devotedly to the IRunFar Twitter feed. Thanks to trailandultrarunning.com, we were introduced to the elite runners’ race reports, learning about S! Caps, and the importance of a good headlamp. As my mom’s ultra, the North Face Endurance Challenge 50 mile race in Wisconsin was three weeks away, my duty as pacer changed to participant. We ran every step together, discussing which of her pre-school students are her favorite this year at mile 15 and cursing the hills at mile 40. Though she twisted her knee and was reduced to a walk/run the last 3 miles, I met each step right along side her, supporting her to the end. During that race, our roles changed; I was the one guiding her, pushing when she wanted to stop, just like she was there two years ago pushing me during my first 8 mile run. I would never been a runner or an ultra-runner without her, and I cannot wait to continue onto the next trail with her by my side. My mom and I after our first 50 mile ultra-marathon. Us on our longest consecutive training runs. In 2011 I thought of a way to kick start my life as I undertook a new job as a therapist working with people struggling from addiction and searching for a purpose in their lives. Having a history of addiction myself and being clean for 16 years I thought back on how I had done it. 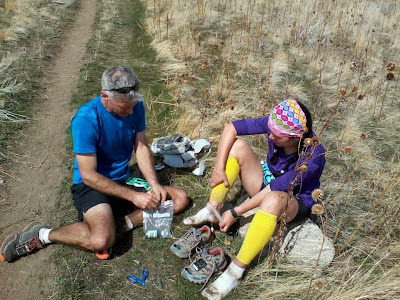 Through support and running I recalled the relationships built and spirituality found on the trails of the Wasatch Mountains that resulted in erasing addiction and replacing it with a more excellent way of life. I knew that if a non-runner like myself could become such, so could they. 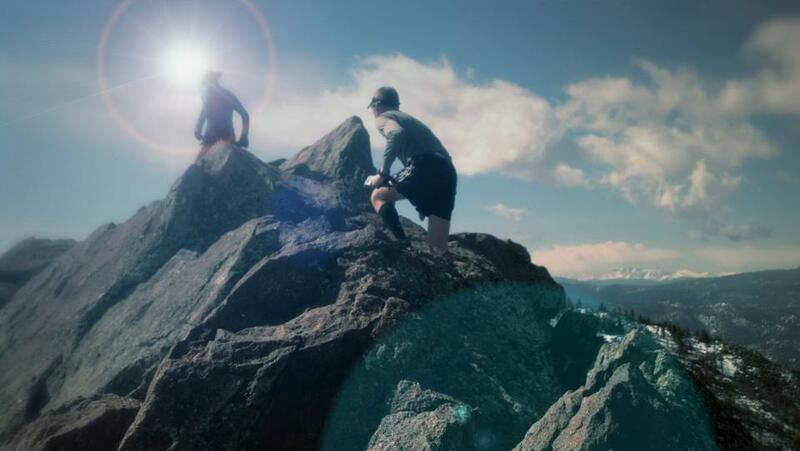 Addict II Athlete’s vision is to assist these new Athletes in recovery from all addictions and get on the path of healing and achieving goals in what could be described as a new path in an Ultimate Direction. A brilliant name for a company that must have the same thought in giving the Athlete the best gear for their journey. When I was added to the trailandultrarunning.com group, I saw runners living the life Addict II Athlete is establishing for our new comers. 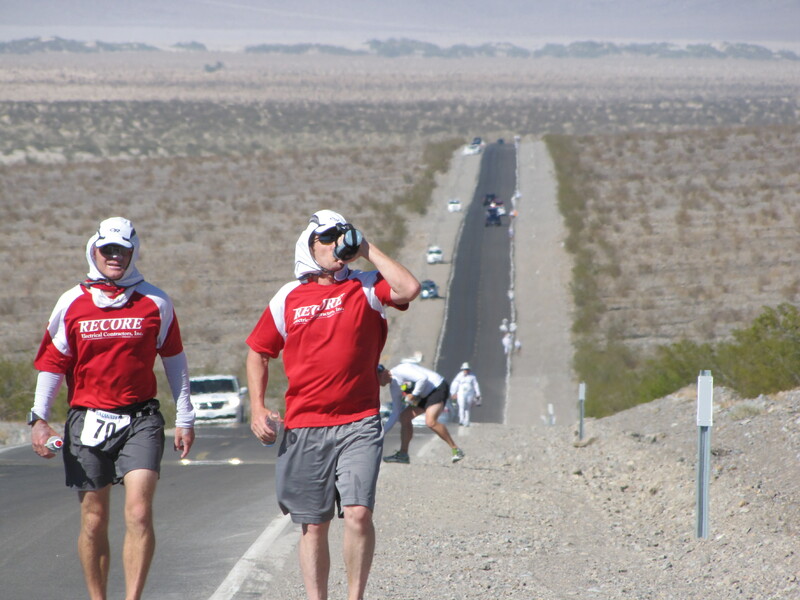 From our first 5k two years ago to running the 2013 Badwater Ultra Marathon, these former addicts leave that life behind and become so much more. For me the real accomplishment in ultra and trail running is experiencing the highest summits, longest stretches and the mental negotiating that proves we can do hard things. Even more inspiring is when you have a group of people others called drug addicts running alongside you because you know they can do hard things as well. Because nothing’s impossible…it just may take a bit longer. My mother-in-law makes some positively amazing meatloaf. I don’t know what’s in it and I don’t want to know. I like the mystery. (I can only assume that ingredients include a mixture of sunshine, rainbows, and unicorn sparkles. Trail running is the same way. There are lots of little mysterious elements that make it so seriously wonderful. Allow me to transform myself into Martha Stewart (never mind, I’ll skip the prison time) and expound on three ingredients that make meatloaf, I mean trail and ultra running so awesome. Sure, you can see some beautiful stuff running on the road. I mean those parked cars and miles of endless white line on asphalt are nice to look at. But there is nothing that can match the beauty of a trail weaving through the aspens or climbing to the top of a mesa and seeing the expanse of nature surrounding you. The point is that sometimes your experience on the trail can be as bad as an episode of Golden Girls. And sometimes it is a magically delicious experience (sorry, Lucky Charms for breakfast). I love that feeling of knowing that every run can be an adventure. Runners are awesome people. Runners are family. 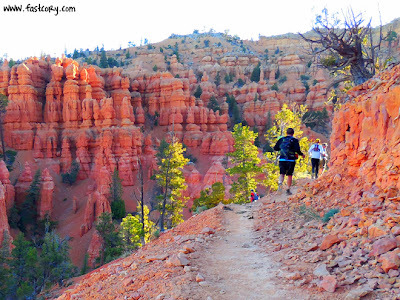 But I experienced a new level of amazing when I got into trail and ultra running. For example, my friend Christie was running her first 100 miler and was crippled with horrible blisters. A guy helped her clean her feet, bandage the blisters, and get her back on her way. He wasn’t a family member. Not an aid station worker. He was another runner. In the middle of his own race. That, my friend, gives me goose bumps. I love this sport. And good meatloaf. Voting for Contest the Vest is closed. Congratulations to Cory – Entry #3 – for collecting the most votes! Thanks to our three finalists and all those that entered for sharing their stories! » Uncategorized » Contest the Vest: Vote now! 441 Responses to Contest the Vest: Vote now! #3! 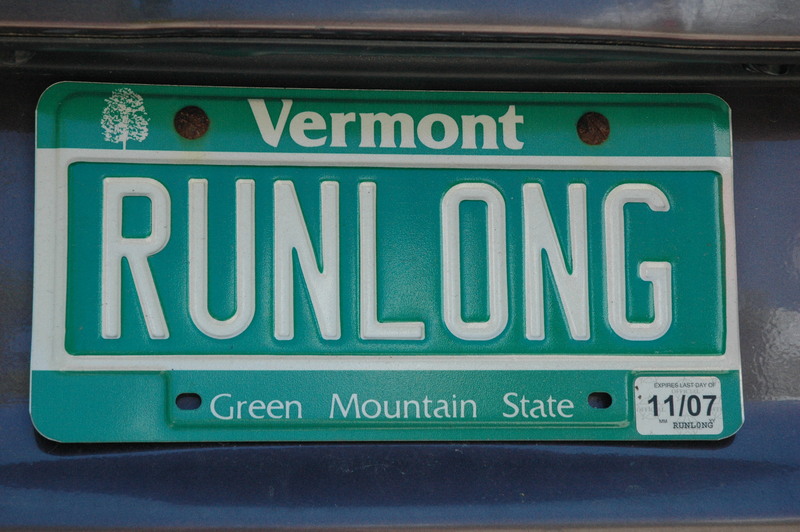 Running is like meatloaf gets my vote!!! #3 — by far the best — no contest. Cory’s is super awesome and makes me smile and laugh weekly!! #3 all the way!! They’re all great, but #3 gets my vote! #3 because of ingredient #3! Could not agree more. 3 for sure. It was the unicorns! Meatloaf rules! I vote #3. How could you not vote for #3? #3, of course!!! #3, thanks for the smile! #3 Love meatloaf, love the run, and most of all, love the Cory! I have ran some trails with Cory and it’s always been a positive experience! He is what ultra running is all about. #3 for the win! Number three all the way! #3…I love mom’s meatloaf too! (That would be Cory’s mother-in-law). And all the fantastic pics make me want to take up running! Entry #2 all the way babeeeeee!!! Go Addict To Athlete!!!!! #2 An Ultimate Direction- Go BLU!!! I vote for story #2! #2! Coach. What an inspiration. I like meatloaf and unicorns, and I love my mom and especially HER meatloaf, but I admire a story about someone doing the right thing for themselves and especially for others. #3 this one really hits home, so many have been affected by addiction and have used outlets like this to replace those addictions. #2 this one really hits home, so many have been affected by addiction and have used outlets like this to replace those addictions. Entry 2. I have watched first hand how this program has been a productive part of society. The struggles each and every Athlete has faced head on and accomplished their ultimate goal. Each one holds so much passion and drive, encouraging everyone around them to improve. They are incredible! Thanks Blu for saving one of my best friends and so many other wonderful people. CHAMPIONS… most definitely! I vote for #2!! Changing the world one step at a time. Amazing story. #2 all the way! Look at you coach! Still being a champion and an inspiration! My vote is with #3! I vote #2 all day long and twice on race day. I vote for #2. Very cool! I vote #2. What an incredible program for those that have almost lost hope. I vote for #2! I have seen miracles with Addict II Athlete in clients, their families and it even inspired myself and my 9 year old son to do at least one 5K a month. AIIA is a family of recovered addicts and family and friends! #2 Go Blu! Exciting to hear you are doing something so incredible. #2 is where it is at! #2 – You Rock Blu! Cory gets my vote he is the greatest!! Love them all, really cool people! Number 2! my vote seems to have disappeared… #2! vote for #2 go BLU!!! I vote #2 Blu is one of the greatest men I know!! He not only teaches but lives through his teachings. Luv that guy!! #3 Cory all the way! Entry #3 is AMAZING!!!! Not only do his photos show the beauty of trail running but he has an awesome way of conveying a sport that is truly the ultimate in fitness. #3! Trail running and meat loaf. Both make me excited/want to die. #3 is the right ingredient. #1!!!!!!!!!!! Vegetarians do not eat meatloaf! Besides, what is more important than your own family? #3 for sure. Cory is the best. #2 – Blu is a true inspiration! Go Blu! #3 Cory is the Man! You’re my boy Blu! #2!! Wow – incredible stories! I love these!! But my heart is always with the FOOD. I vote for Pedro! I mean, I vote for #3! Definitely #3– any reference to meatloaf AND a unicorn is always a winner in my book! But each was very good. I vote number one… go mother and daughter.. Entry #2. No question asked! Let’s hear it for number 2! Thanks Blu, AIIA saves lives! 2!!!! Wonderful stories. 2 Blu for me please. MOM! The MEATLOAF! I vote #3! Nothing goes together like unicorns and meatloaf! Number 3!!! #3 Meatloaf will always get my vote. #3!!! Count me in for Cory! #3 Cory–he is an inspiration to many people across the world!!! #3 all the way! Corey is the best! I vote for #3 Cory because he is an ongoing inspiration of running awesomeness for me. I vote for Entry 3!!! #3 all the way. Cory is such an inspiration. Love #3! And now I want some meatloaf…or is it an ultra I need?? Love number 3. Go fast Cory! I vote for #3. Cory is the best. #3. That Cory sure is AWESOME!! #3 Cory, meatloaf, and trail running are the best! All are great, but I have to go with #3, by my mentor Fast Cory. #3 gotta love the meatloaf comparison! AIIA all the way 2!!!! #3 hands down! love meatloaf! #3 gets my vote ! AIIA all the way! #2! Champions!!!! #3 is awesome! Go #3!!! #3 I AM A UNICORN!!! Definitely Numero tres. That’s 3 for the unSpanishized folks. The other two entries are great but I’ll go for #3. One more push guys! 2! Number 2 for the Blu!